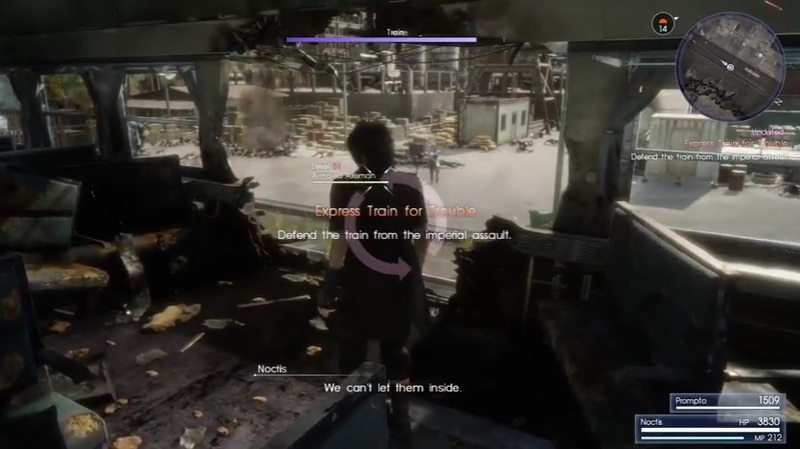 This page contains a detailed walkthrough of Chapter 11 – In the Dark in Final Fantasy XV, including quests, objectives, items, enemies and bosses encountered in the game. 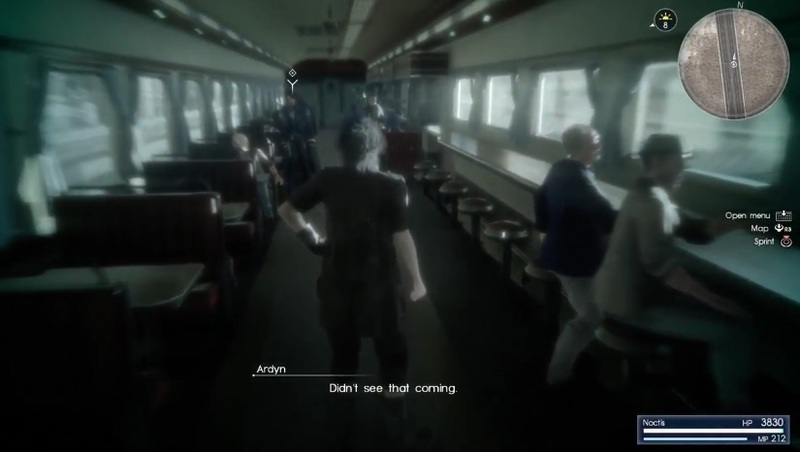 The chapter starts with Noctis and Ignis sitting together on the train heading towards Gralea. 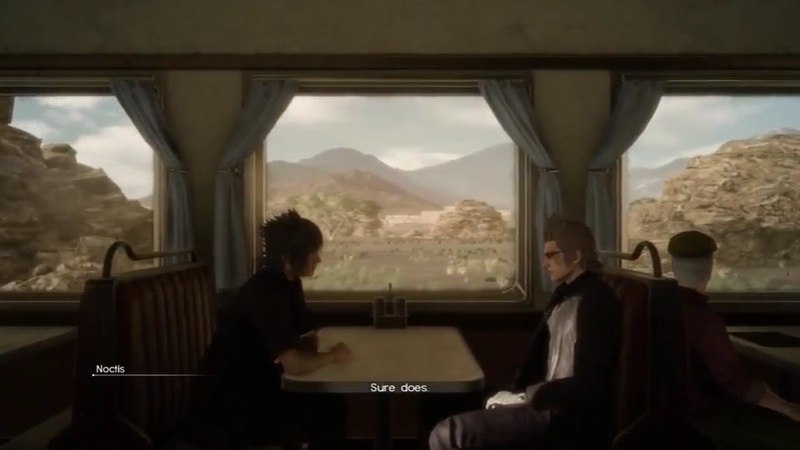 Ignis asks if Noctis is eager to drive. The prince chuckles at the thought, saying that’s if they let him. Ignis also says they’re lucky to even have the Regalia and owe the First Secretary their thanks for returning the car to them. While Noctis says that the First Secretary would have gotten more respect if she gave them a discount, Ignis notes about the transmitters. Ignis visibly watches his words especially about the fight with Leviathan. He mentions that the transmitters were top notch and there was own carrier that remained. Noctis notes that it belonged to the chancellor. Noct takes note that Gladio has arrived and that Ignis sent him out on recon. 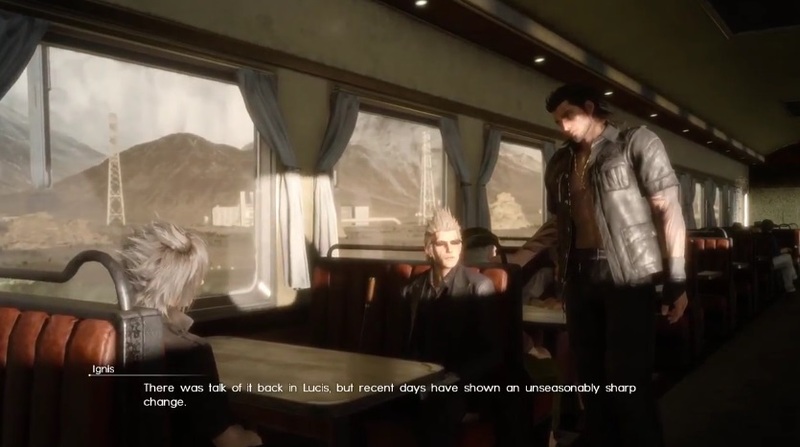 When Gladio returns, he tells them that the nights in Eos have been getting longer. 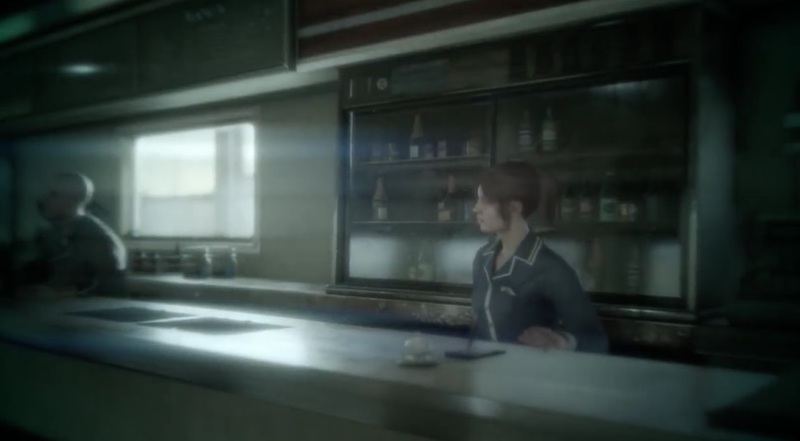 It was once just in Lucis but now, it’s covering the whole world. Noctis and Ignis both come to the same conclusion. Should this trend continue, there soon won’t be any daylight. 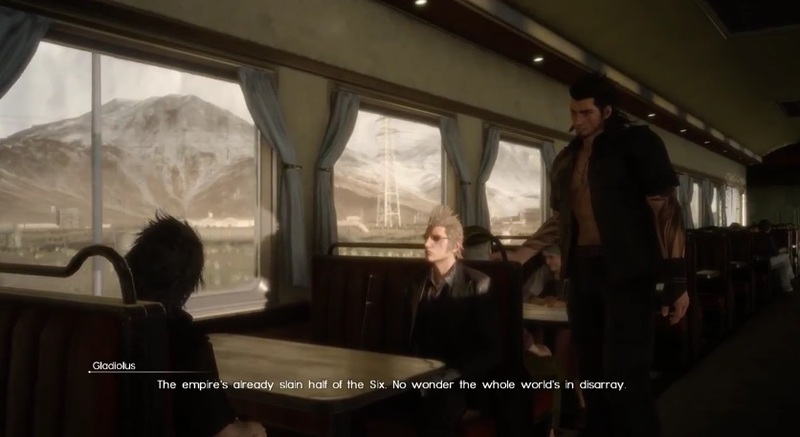 Gladio mentions, because the Empire already has slain half of the Six Astrals, everything’s out of balance. With that, stopping the calamity might be impossible. After all, the longer the nights, the more daemons come out. 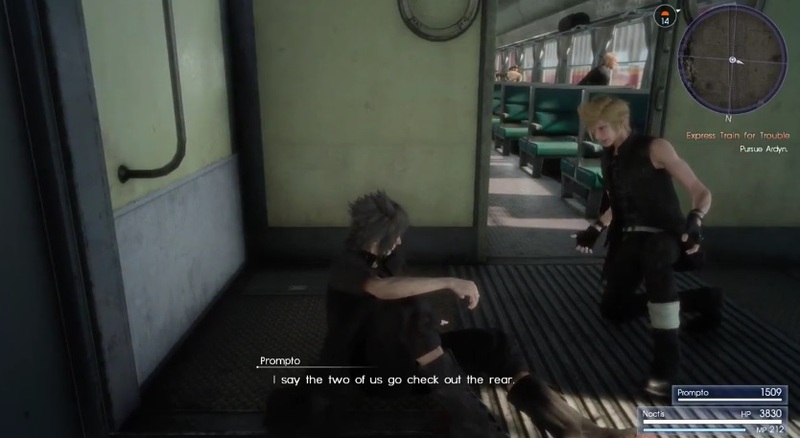 Gladio also tells Ignis that he brought the informant. With that, Ignis takes his leave. 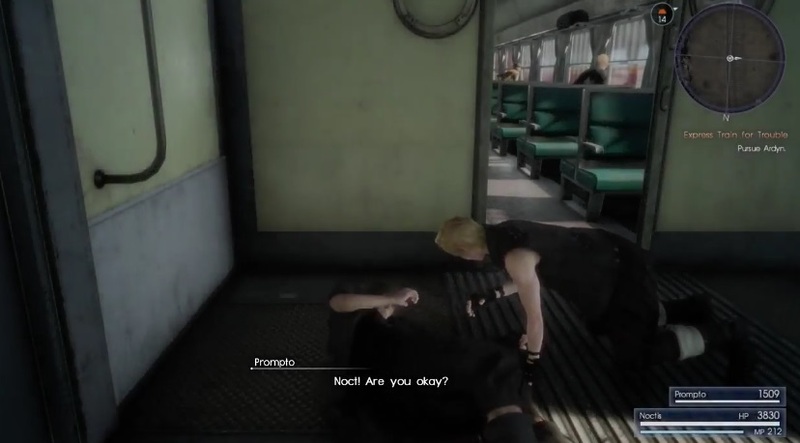 Meanwhile, Noctis is left alone until Prompto comes dashing in. 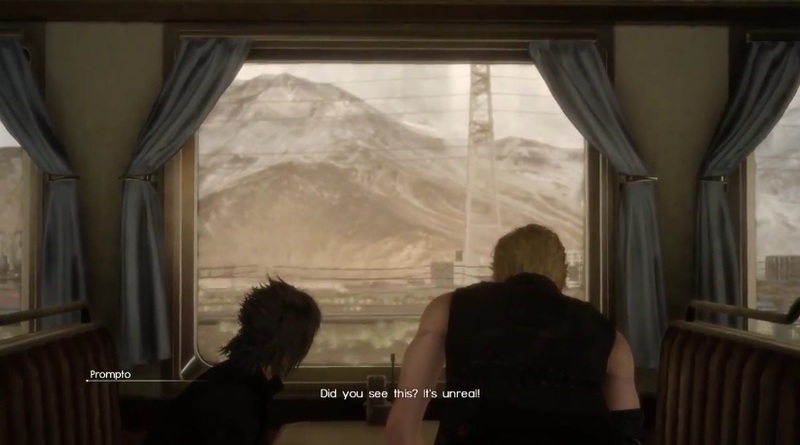 Both of them notice a weird change in the sky which Prompto notes as completely “unreal”. The skies change and behave differently. At the sight of it, Noct and Prompto agree that nothing’s making sense. Prompto then dashes off again and leaves Noct until the prince notices something wrong. Time has completely stopped. Amidst the chaos, Noct soon finds himself facing a very familiar face: the chancellor of the Empire himself, Ardyn Izuna. 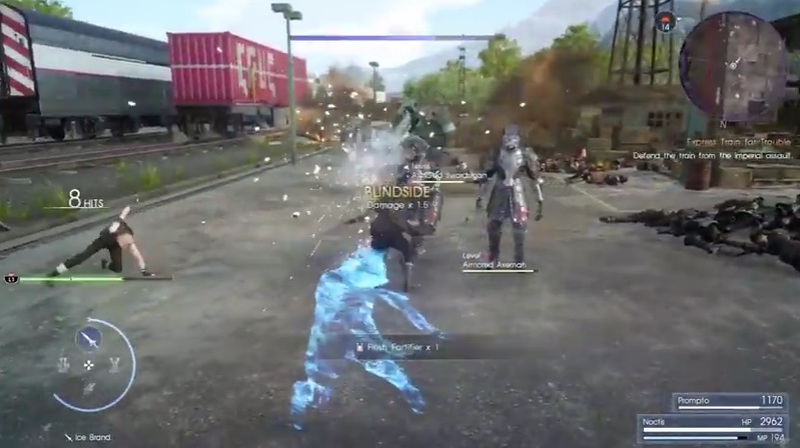 In a fit of fury, Noctis charges at him and tries to deck the guy. Ardyn moves aside and tries to calm the raging prince down. This happens twice while the first just has Noctis trying to slug him, the next one has the prince wanting to cut him down. At the sight of that, Ardyn flees. 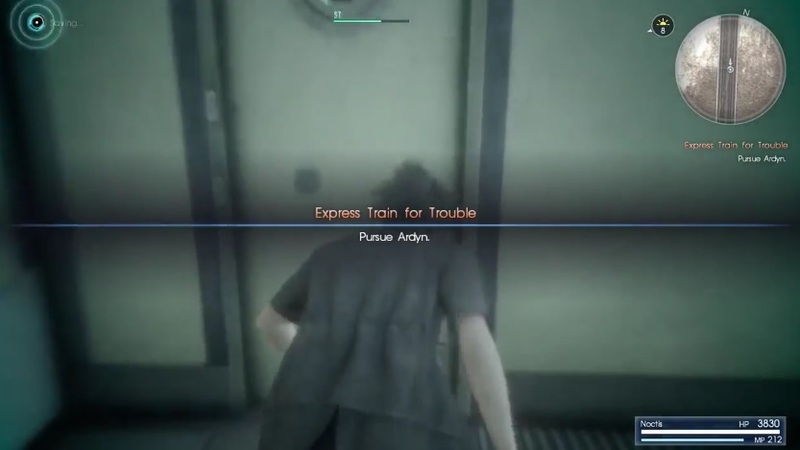 Pursue Ardyn through the train and wrench open the first cabin door on your right. 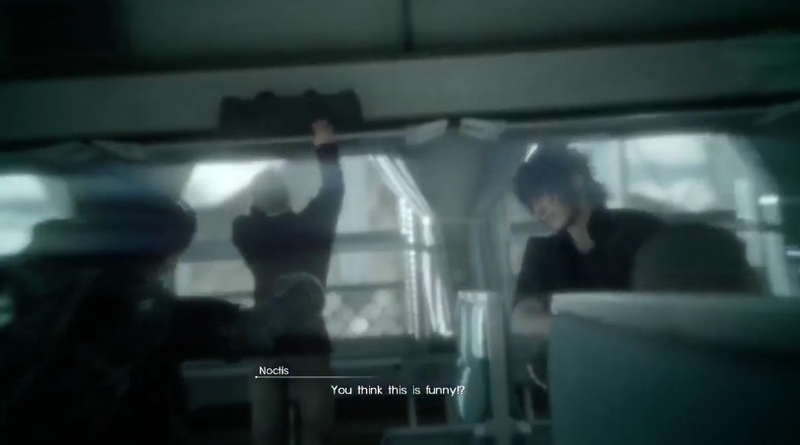 Noct demands that the chancellor shows himself only to see that he disappeared. 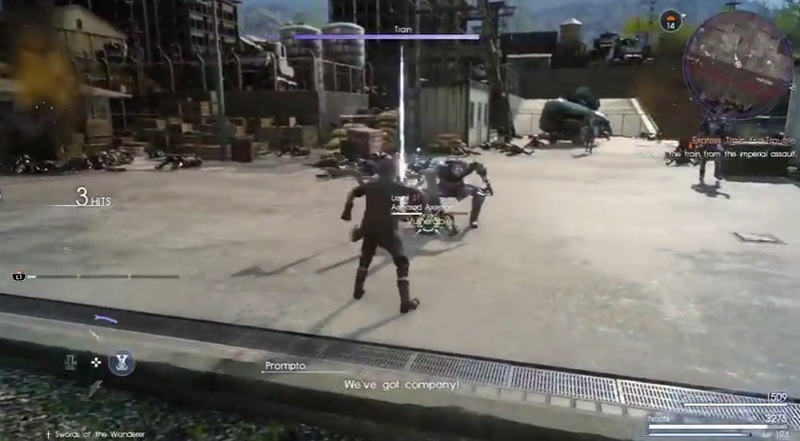 Ardyn taunts him by appearing right behind him which Noct tries to attack him again. He vanishes. Head down the hall into the next car where Ardyn says that the prince is spooking him. Chase him into the next car where Noct draws out his sword and tries to behead him. 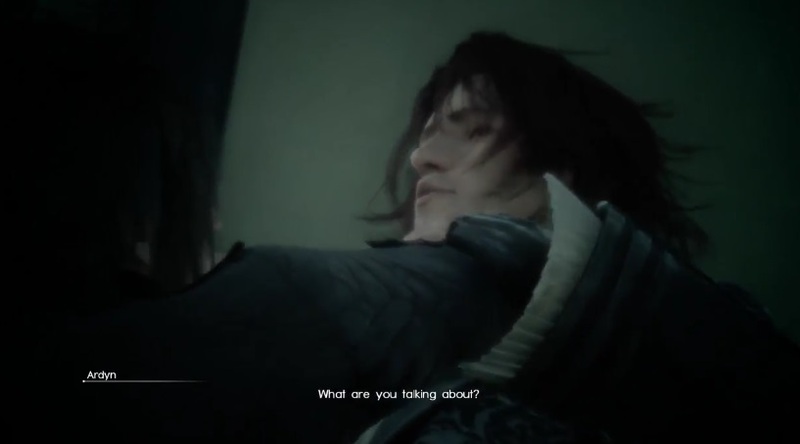 Ardyn asks if Noct is really trying to kill him to which the prince replies, “why wouldn’t I?”. There, you corner the chancellor into the next car where you trigger a cut-scene. Ardyn is cornered by Noct who chokes him against the wall. He snaps at him and blames him for everything that’s happened to him. Ardyn asks if he and Noct can talk but the prince refuses to listen. Suddenly, the train makes an abrupt stop and throws the prince onto the ground. With that, Ardyn vanishes and Prompto finds Noct on the floor. The blonde wakes up the prince, asking him if he’s okay. Noct sullenly replies but still asks where Ardyn’s gone. Prompto tells him that’s he didn’t see him. 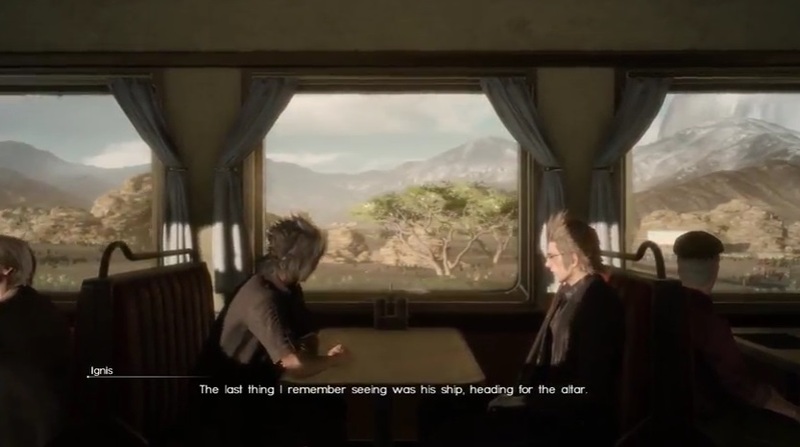 But he says that if Ardyn is there, that would explain why the train stopped and why everything weird’s going down. 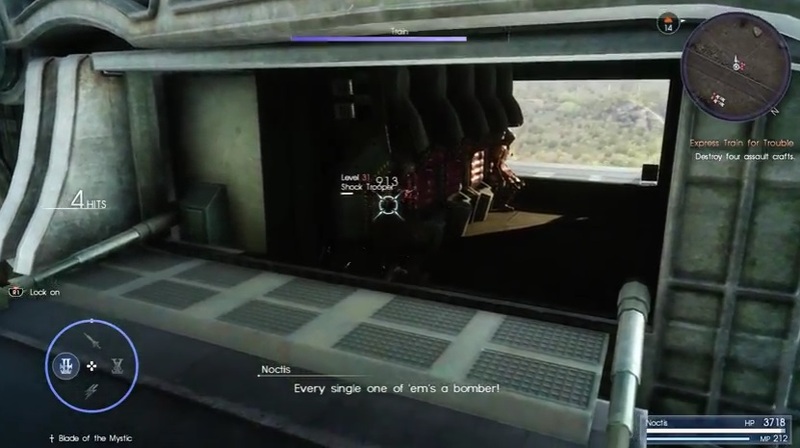 He also tells you that Ignis and Gladio went to inspect the engine room while suggesting they should go check the rear. Get up and head towards the end of the train. Head back all the way to the train where you came from. While running, one of the cars will suddenly shake. 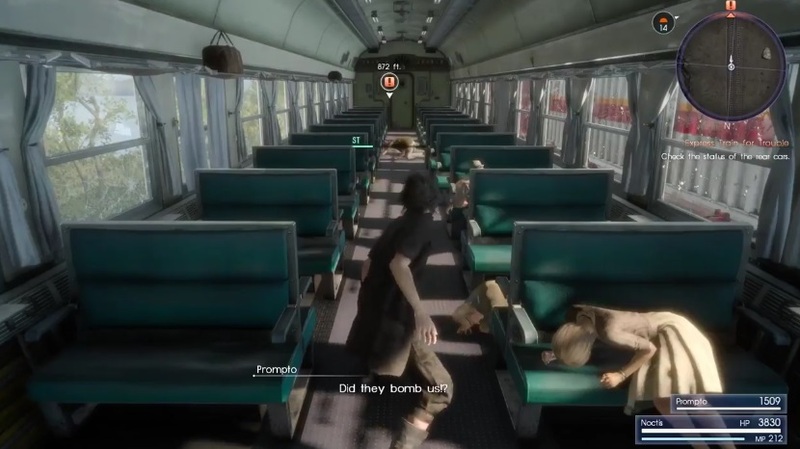 The people panic and Prompto asks if they were getting bombed. He says also to protect the people on the train. 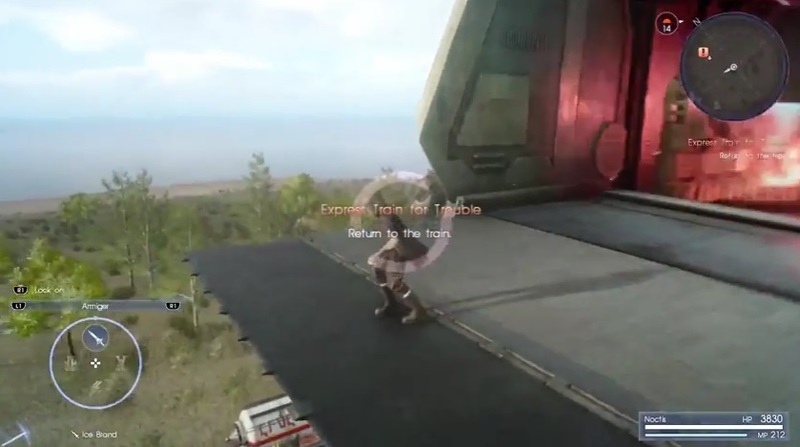 Continue running until the next train where a whole horde of people run out screaming. The window shatters and you’re left to deal with the Armoured Axeman that just broke through the window. Check all your items and your skills before attacking. When you’re done, kick the Axeman to the curb and continue running through the train. Continue running until you reach a car where a flamethrower just shatters the glass. Noctis gets blown back and Prompto notices the Imperial Soldiers outside. With that, you change your objective: defend the train from Imperial Assault. 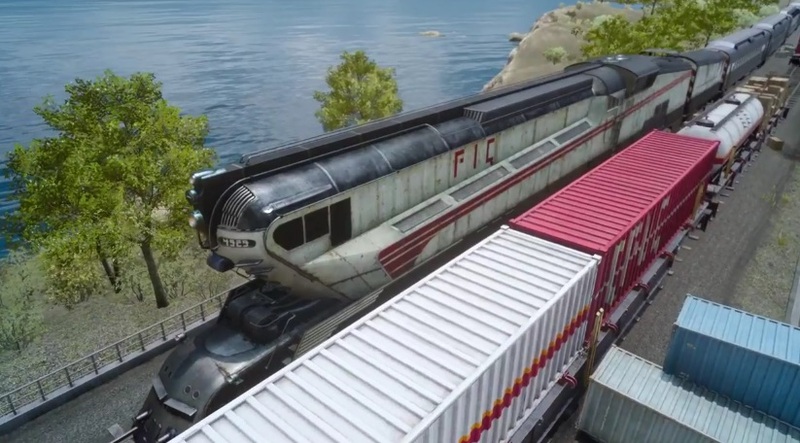 Imperial Shock Troopers will be gathering around the train and if they blow the train, it’s game over. When you start the battle, prioritize the Imperial Shock Troopers. Take them out first as they can damage the train the most. Close the distance between with your Warp Strike and the convenient towers around you. Also, you can open with a barrage of swords before closing in to unleash a full combo in the soldier’s faces. When battling your way through, beat the daylights out of them as if they’ve sunken your favourite ship and nerfed your most favourite character. Your enemies will drop an array of items such as a Muscle Stimulant, a Flesh Fortifier, and etc. However, the battle gets bad when the Imperial army decides to roll in a tank to damage the train. While battling, now you have to prioritize both the tanks and the Shock Troopers. When trying to take down the tank, use your point-warp to close in and smash the tank before it blows the train into smithereens. 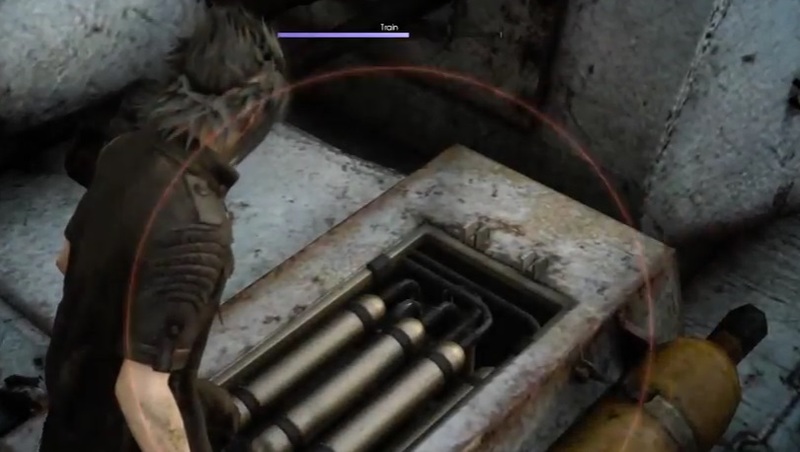 Once you point warp, Noctis jams one of his swords into the power tank before warping away to a tower. 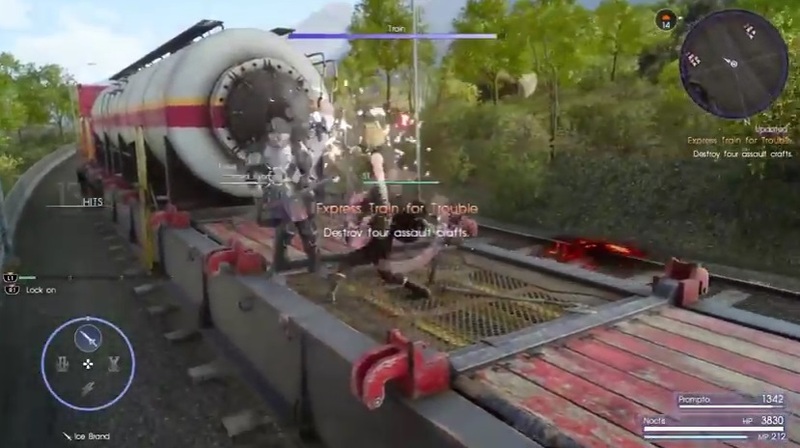 With that, you end the battle and Prompto calls you back onto the train. Warp back onto the train and then move towards one of the tankers. 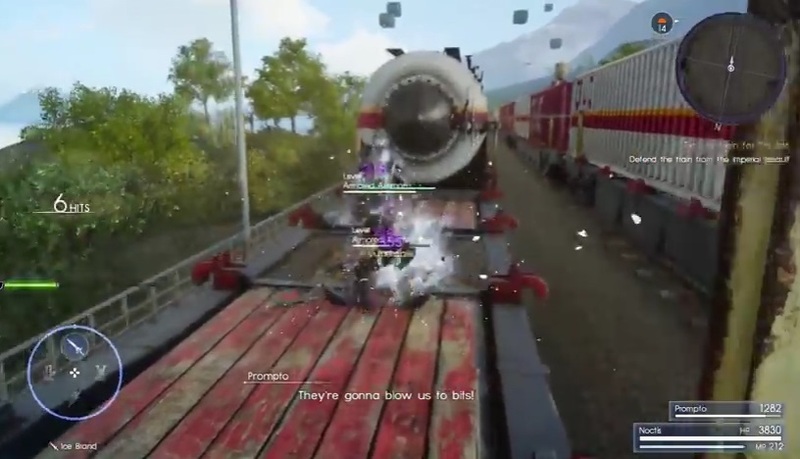 Prompto mentions that they’re following you and intend to blow up the train. 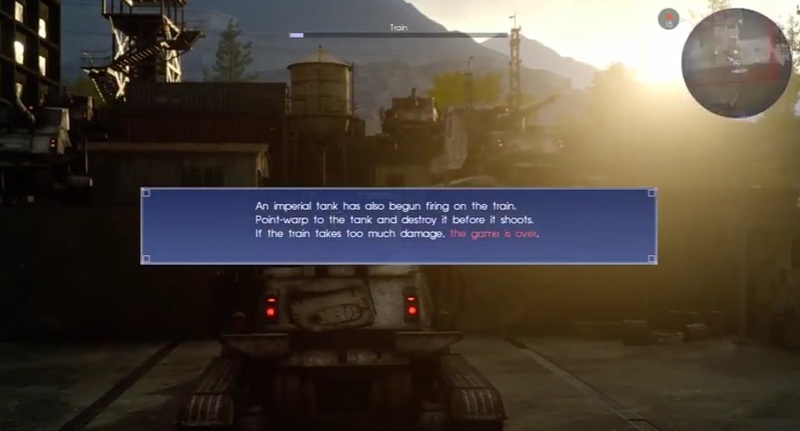 After taking out the soldiers, Prompto says that there are Imperial Assault crafts coming. While the soldiers are coming in, Imperial Assault Crafts will be shooting at the ship. Have Prompto handle the soldiers while you warp out to kick down those Imperial Assault Crafts. While you go warping around, you find out that each and every Imperial Assault Craft is carrying a Shock Trooper. The good news is you can have the Shock Troopers self-destruct or you can use the turret if hacking and slashing your way through takes too long. After blowing four Assault Crafts, warp back to the train. 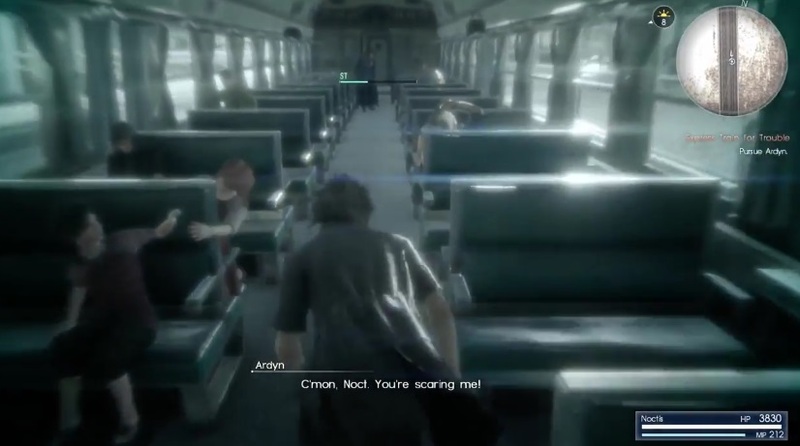 The moment you get on the train, Ardyn will have a gun pointed at Prompto’s head. In a fit of rage, Noct lunges at Ardyn and tries to hit him down. 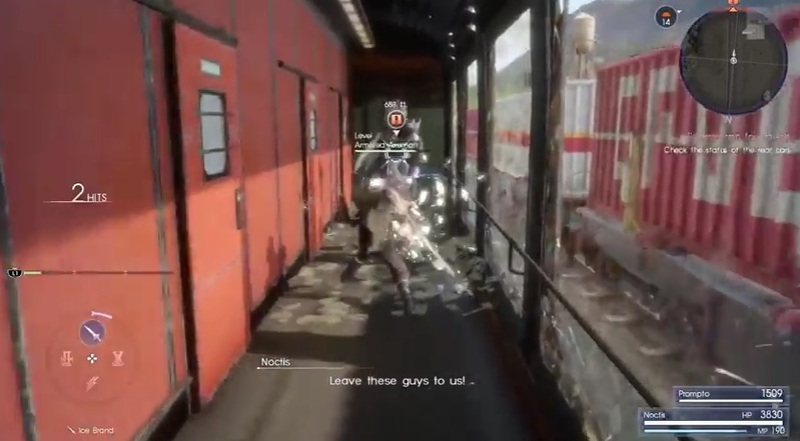 He disarms him and knocks him off the train only to realize that it was Prompto he knocked off by mistake! With that, Ardyn asks him: how long have you been in the dark? Before Noctis could answer, Ardyn pistol-whips him in the head and knocks him out cold.